Rose Gold Eternal-Love Anniversary Ring. 1.0CT - Eternal-Love 14K rose gold anniversary band. the ring holds 10 round brilliant diamonds with total weight of 1.0ct. The diamonds are graded as SI1 in clarity G-H in color. 14K Gold Eternal-Love Anniversary Ring. 1.0CT - Eternal-Love 14K gold anniversary band. the ring holds 10 round brilliant diamonds with total weight of 1.0ct. The diamonds are graded as SI1 in clarity G-H in color. 14K White Gold Eternal-Love Anniversary Ring. 1.0CT - Eternal-Love 14K white gold anniversary band. the ring holds 10 round brilliant diamonds with total weight of 1.0ct. The diamonds are graded as SI1 in clarity G-H in color. Platinum Eternal-Love Anniversary Band. 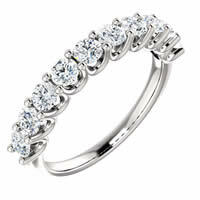 1.0CT - Eternal-Love platinum anniversary band. the ring holds 10 round brilliant diamonds with total weight of 1.0ct. The diamonds are graded as VS in clarity G-H in color. 18K Gold Eternal-Love Anniversary Ring. 1.0CT - Eternal-Love 18K gold anniversary band. the ring holds 10 round brilliant diamonds with total weight of 1.0ct. The diamonds are graded as SI1 in clarity G-H in color. 18K White Gold Eternal-Love Anniversary Ring. 1.0CT - Eternal-Love 18K white gold anniversary band. the ring holds 10 round brilliant diamonds with total weight of 1.0ct. The diamonds are graded as SI1 in clarity G-H in color.